If you look closely it has a lot of what I call "zen rock formations" on them. Maybe there's a more accurate name for it, but I'm sticking to this. I thought this would make for good practice on composing a shot, focus control and lighting. I revisited this rock the next day to shoot some more in golden light. You should be able to tell just by the colors in the photo which ones were done in bright overhead sunlight, and which were shot in golden hour, the hour or so before sunset. One thing that I have only recently gotten my head around is how aperture, the mechanism for controlling how much light hits your sensor, effects focusing. I suppose I knew on some level how a lens with a larger opening (smaller aperture, of f-stop number) would give you a smaller focal plane, the area of a photograph that is in focus, but I didn't really think about how things work on the opposite end. So I thought I'd play around with this theory. 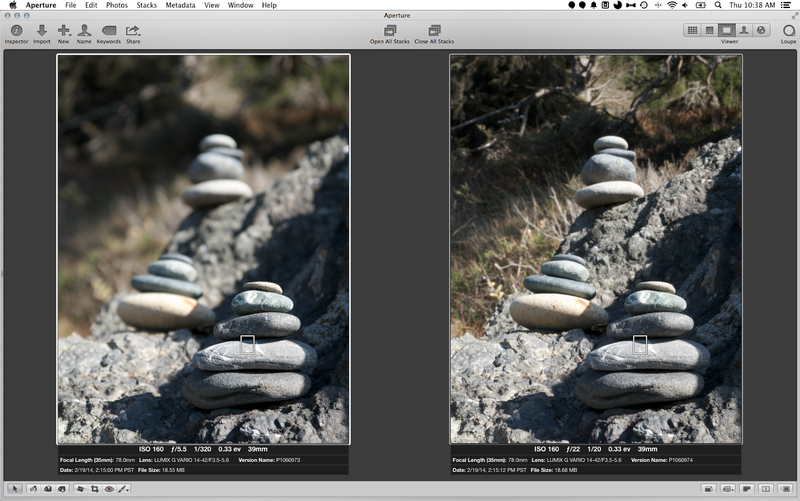 This photo shows the same scene with almost the exact same camera settings with focus on the same area as shown by the white box, only the aperture has been changed. The shot on the left used an f-stop of 5.5, nothing to really brag about in terms of speed and light gobbling ability, but you'll see it nicely blurs things from just behind the front formation right on through to the end of the photograph. Looking at the photo on the right you'll see decidedly less blur throughout the image. The aperture is set at f22 which is the smallest opening this lens allows for. The overall photo is not as sharp as the front formation, but it is decidedly less blurry. The reason for this, I think, is because I'm very close to the front formation making this almost a macro-like shot and limiting my plane of focus. Overall I had fun shooting these fun rock formations and made it an album that I shared earlier on Google+ and am just now getting around to sharing on here. One thing I wasn't happy with was how I captured the bigger rock holding these formations. My various shots come off flat and the viewer can't easily tell why this is at all interesting. Meaning the formations don't show up well against the larger rock. I'm not a big fan of Picasa/Google/Google+'s Flash required album viewer, which I'm showing below, but here's a direct link to the album on G+.